It’s our annual chili cookoff! As usual we’ll be hosting at Appliance Associates of Buffalo (200 Amherst Street Buffalo, NY). This year, we’re adding Soup to the menu — more details to come! The Suicidal Saucies make their 2018 debut against the Devil Dollies. 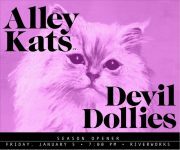 The Kats & Dollies square up for the second time in 2018. The initial session of our Spring 2018 Roller Derby Boot Camp begins Sunday, 2/25 at 8am at Rainbow Rink in North Tonawanda, NY. More details on our recruiting page. See our travel teams kick off their 2018 season with this mix-up exposition! The Saucies and the Dollies meet up for the second time in 2018.